This post initially appeared on Wayward Strategist. About 3 months ago, I wrote a pretty long and, admittedly, rather rambling post about in-match progression in real-time strategy games. My core premise in the article was that while base-building and economic operations can be instrumental in providing players with important fine-grained control over their success in the game, they also present some seldom-addressed issues: namely, that such systems promote the type of imbalanced interactions that can limit player engagement and drive players away from a multiplayer game feeling that their losses are unfair. The purpose of the article was less to say that these systems were bad, but more to draw some lines around their limitations. That article also pointed out some RTS games that have tried to design their systems to account for those limitations. 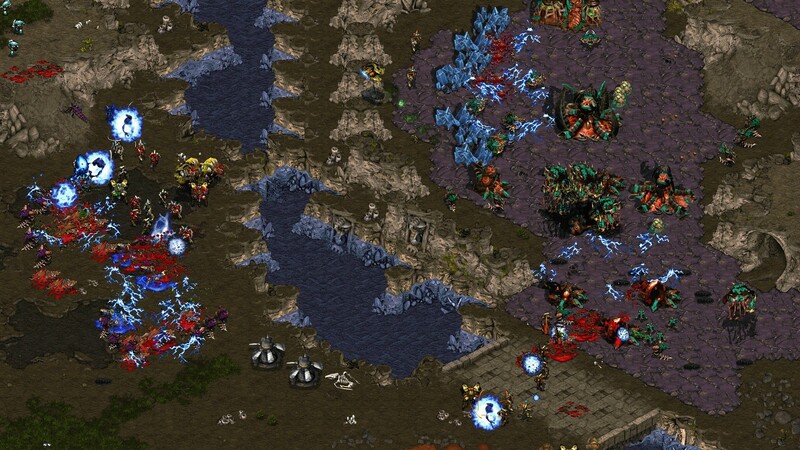 Namely, Legacy of the Void drastically altered the StarCraft 2 early game to shorten it and minimize its impact, and changed the logic of its expansion system to get, and keep, more of the map relevant and keep the player moving. And the entire premise of the Dawn of War and Company of Heroes games revolves around an extremely protracted economic crawl, with most interactions including only a small fraction of a player's total possible fighting force. In my mind, both of these systems are intentionally trying to limit the possibility of wildly imbalanced player interactions and widely differing relative player power at any point in the game. Lately, though, we've seen something new tried in RTS. In the past month, we've seen two new RTS which introduce the concept of 'phases' into their gameplay. Both Dawn of War III and Steel Division: Normandy 44 include some type of built-in escalation, though the implement them slightly differently. While the concept of phases is not new to gaming in general, it's certainly not something seen in many strategy games. But, perhaps I'm getting a bit ahead of myself. First, I will define and describe phases as they appear in Dawn of War III and Steel Division. Then, I will discuss the positive and negative impacts of phase mechanics on RTS. Let's start by defining our terms. In a real-time strategy game, a 'phase' is a match- or game-level process. 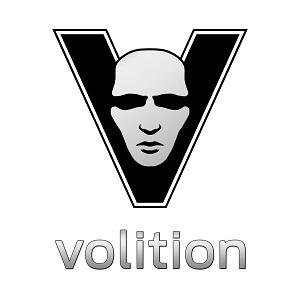 This process applies modifications to all players, or to the game state itself, increasing its effect multiple discrete times across the course of the match. Phases are typically time-based, but they by no means have to be. 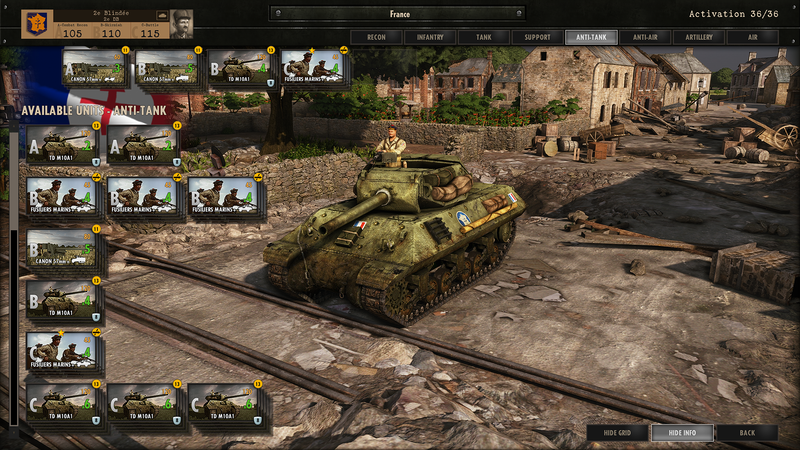 As an example, Steel Division includes 3 gameplay phases titled A, B, and C. In Phase A, the player only has access to a limited palette of units, and their income is relatively low. Phase B kicks off 10 minutes into the game, and unlocks a larger selection of unit types for deployment. During Phase B, a player's income is increased. Phase C unlocks the player's heaviest units, and again increases the player's income. In many ways, Steel Division is vastly different from a mainline RTS. Technically, I would consider it a tactics game since it has no real representation of an economy. In Steel Division, phases act as something of a tech tree, limiting the amount of game-deciding firepower available to players. I'll comment on the relative merits of the system below. 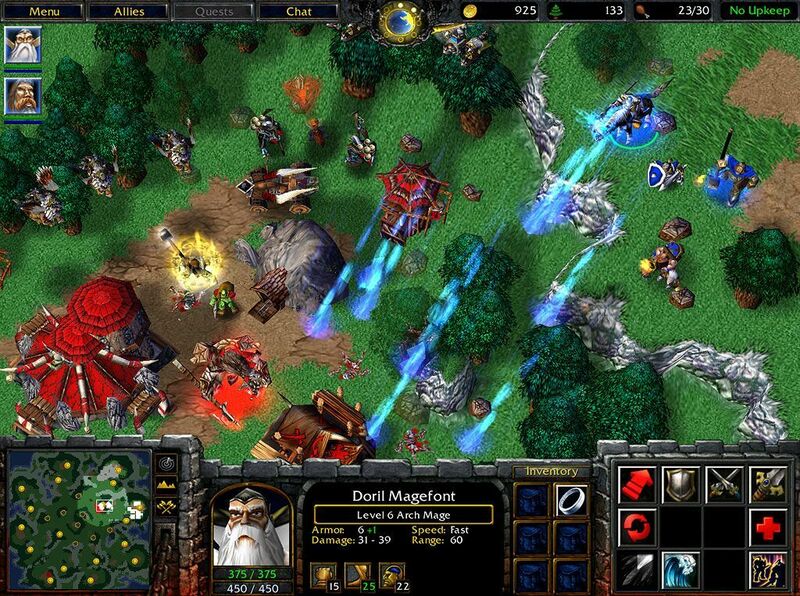 WarCraft 3. Notice "No Upkeep" icon in the upper right corner. Phases can be compared in some ways with the "upkeep" systems seen in some other RTS games, like Company of Heroes 2 and WarCraft 3. In WarCraft 3, a player's gold income is reduced when they cross a certain Food threshold (when they've called a certain number of units onto the field) and decreases again once they cross a second, higher, limit. This method is intended to organically limit a player's effective ability to continue to advance over a disadvantaged opponent, and as a way to subtly influence the game's pacing. It's a relatively weak cost/benefit system that, among other things, will organically curb a player from getting too far ahead too quickly. One interesting aspect of systems like Upkeep and Phases is that they can be fine-tuned to only impact balance at a specific point in time or gameplay condition. Such systems allow gameplay designers to tweak only the early game, or only the mid game. Definitely nothing to sneeze at. Phases work slightly differently in Dawn of War III than they do in Steel Division. 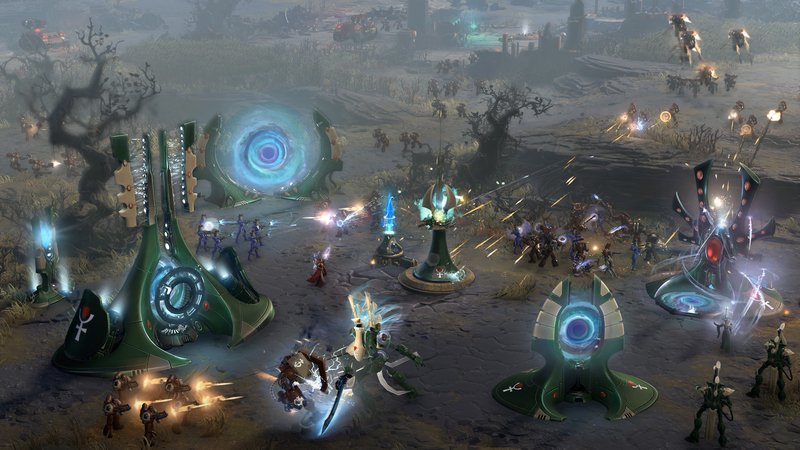 As in the latter title, Phases in Dawn of War III increase players' income, but access to units is not directly linked to the game's current Phase. However, Phases in Dawn of War III increase the durability of match objectives, and decrease a refund that players initially receive on the cost of squads they've lost. Dawn of War III also includes 4 escalation phases. Lategame combat in Dawn of War 3, featuring Eldar vs Space Marines. In Dawn of War III, phases have been implemented with the express purpose of scaling the game from a tactical experience in the early stages, to a clash of massive armies in the later game. Phases are integral to that process. In the early game, players have a small number of squads, and the loss of even one is keenly felt. This is slightly offset by a refund of the lost squad's cost, in theory preventing a player from falling irrecoverably behind if they lose a squad or two. Phases 2 and 3 reduce this refund while increasing overall income, allowing for the production of much larger numbers of units, and making higher tier units more accessible. The increased durability of match objectives is designed to keep their defenses relevant as the overall power of each player spikes dramatically. One of the notable aspects of Dawn of War III and Steel Division's phase systems are that is capable of resetting the match in terms of which player is ahead when a phase ticks over. This is not a guarantee: falling critically behind can still be a death sentence, and the player who's ahead going into a new phase can cement it or pull off a win in the next, but in both games I've had situations where a new phase has been enough of a boost to save my bacon. For better or worse, anecdotes are not good evidence to support an argument. My intent is to illustrate that I have experience which tends to reinforce my belief that Phases systems can and should target ways to reinforce what I like to think of as homeostatis or equilibrium in strategy gameplay. The real question is, do they work? Does the phase functionality fit into the overall framework of a competitive strategy game? Does it add to, or subtract from, the overall experience? StarCraft Brood War. Can't just jam combat phases into a game like this! Obviously, any mechanical interaction or gameplay system must fit into the overall context of the game. Jamming gameplay phases into Brood War isn't going to just make a better game (presuming such a thing could even work). The real, fundamental questions are, what is the goal of gameplay phases, and does it achieve that goal? A secondary question would be, is there another system that does this job better? As mentioned above, gameplay phases serve to set broad constraints on a game's pacing: it's pretty hard for one player to get out-of-control ahead of another player economically in the phases systems implemented in Dawn of War III and Steel Division. In most competitive formats, all players begin and remain at roughly equivalent levels of power across a game's duration. 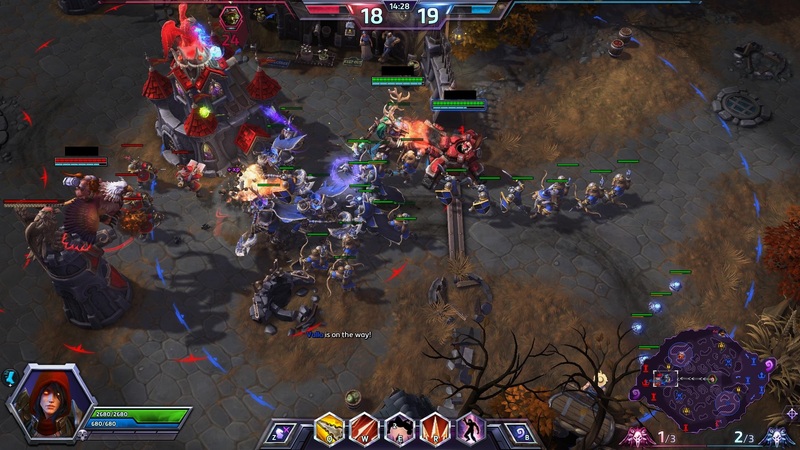 From FPS, to fighting games, to MOBAs, while players are able to unlock or obtain incremental or temporary or positional advantages, winning at a competitive game is often a matter of attaining some sort of meta-objective: number of player kills, more successful rate of completion of a game objective, destruction of neutral obstacles. Success is often generally equally obtainable for a player whether their team is behind in completing an objective, or not. Obviously, this is not the case in most RTS. In most RTS, the game objective is tied to a player's infrastructure, and a player's capabilities are also tied tightly to infrastructure. Therefore, economic and tactical operations are inherently going to start tipping the game in favor of a player who manages to gain an advantage. Now, this isn't necessarily a bad thing. But I think in modern RTS design, imbalanced interactions and situations where a player has a high likelihood of being unable to properly address a threat are being, rightly, targeted for mitigation. Remember earlier, when I mentioned how Blizzard truncated the early game phase in StarCraft 2 with the Legacy of the Void expansion? A big piece of this was related to the frustrations of hair-trigger response times to certain powerful early game strategies (at least, in my opinion). LoTV also attempts to keep players out on the map more: players have to take bases earlier and more often. The solution in LoTV seems like a band-aid to me: a sophisticated kludge to address the underlying structural issues inherent in the common RTS formula. And gameplay phases feel similar in some respects: they're a system intended to keep the playing field even and players competitive against one another for longer. Moving into a new phase is a huge deal in Steel Division: everything changes abruptly when a phase ticks over. It's a pivotal moment where new things can happen. 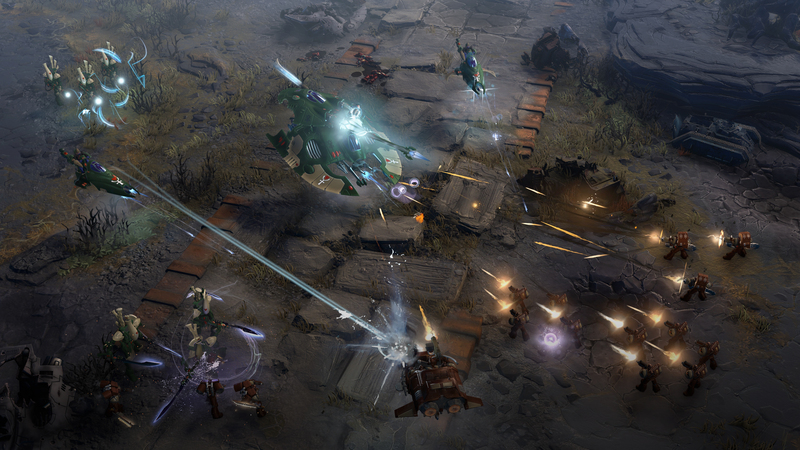 In Dawn of War III, moving into a new phase is a more subtle thing, oftentimes. You're kind of gradually becoming better, and it just gives a bump to that process. You don't *really* notice it at first. To me, however, Dawn of War III's phase system feels more artificial, and it's worth examining why. There are two standout issues that I see with phases in RTS games (at least, that we've seen with Steel Division and Dawn of War III). First and foremost, a major component of every successful RTS is that such games allow as much freedom as possible for a player to succeed or fail on their own terms: incremental gradations of skill along multiple axes are a vital component of a successful RTS formula. And locking part of the game down, while it technically solves some fundamental issues, still kind of feels like... locking part of the game down. Game design is a series of tradeoffs, and the phases systems we've currently seen implemented in Steel Division and Dawn of War III still kind of feel like tradeoffs to me. I do enjoy both games, and I feel like phases are more beneficial than detrimental in both cases. But, in both cases, I can't help but feel that phases restrict player agency in crucial ways at the same time as they ensure relatively equal player interactions. Supreme commander Forged Alliance - in the late game, economy takes off and Experimental units are able to be built. All RTS games have inherent phases determined as a consequence of their mechanics. 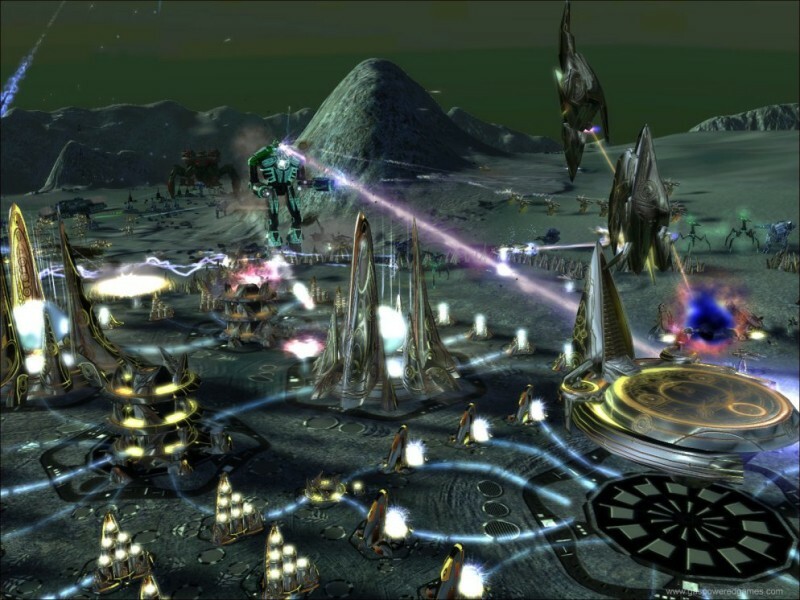 In Supreme Commander, for instance, deciding to move into tier 2 is a pretty big deal for a player, and fundamentally changes the nature of interactions between the players from that point out. Likewise, in Planetary Annihilation, a player getting Orbital technology is a... phase shift in terms of how the game is played from that point out. In StarCraft, moving from one base to two, and from two to three, changes the calculus of how the players interact with each other. What we see with the implementation of phases is the attempt to move a player-level system to a match-level system. I think it's a laudable goal, but I'm not sure the current implementations are sufficient to be broadly useful for future games. Future phase systems - and I hope to see more games experiment with this - need to learn from what we see in Steel Division and in Dawn of War III and find ways to both sell themselves as a more natural and welcome part of the gameplay experience, and to allow as great variety of tactical options within each phase as possible. 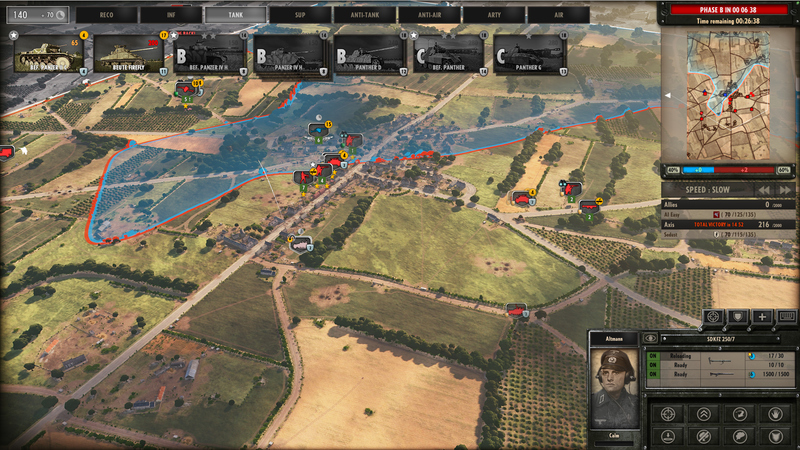 Of the two, Steel Division's system is probably the more sturdier and future-proof: the game's deck-building bakes in a wider array of tactical options for each player, and the overall more focused (a word I chose intentionally in contrast to "limited") palette of gameplay options ensures that players have the time and ability to make more lateral, incremental and nuanced actions within the confines of each phase. Therefore, phases in Steel Division are a welcome unflowering of power as opposed to feeling like an artificial restriction of power, which can feel like the case in Dawn of War III. Dawn of War III's phases make it very difficult to access a wide variety of unit options in the early game, and the high-impact damage and difficult-to-disengage fights all serve to exacerbate the very issues that its phase system was intended to resolve. A morale system, a retreat function, and/or some way to more reliably call in even a single vehicle in early phases would go a long way to making the system feel more friendly and natural. I don't think that phases are the future of RTS, but I think they can have a place in the future of RTS. And I do really, really appreciate the bald evidence that professional RTS designers are focusing on systems which allow players to have an overall more positive experience within the RTS genre. As an whole, RTS have gotten pretty good at figuring out how to allow players nuanced tactical and strategic control of their gameplay. The next big challenge will be figuring out natural ways to encourage homeostasis, and allow a losing player to continue to viably compete and attain the upper hand. With Legacy of the Void and Company of Heroes 2, we've seen some interesting thinking in this regard, and phases systems are another step in the right direction.